Republican Larry Hogan staged perhaps the biggest upset of the 2014 midterm elections when he won the gubernatorial race in deep-blue Maryland, defeating the heavily-favored Democratic candidate by eschewing social issues and focusing relentlessly on the state's tax burden. "I guess we surprised a lot of people. Most people didn't give us much of a chance," Hogan told CBS News Senior Political Editor Steve Chaggaris on Wednesday while attending a Republican Governors Association confab in Boca Raton, Fla.
Now, Hogan wants the GOP to keep his unlikely victory in mind as it looks to the future. 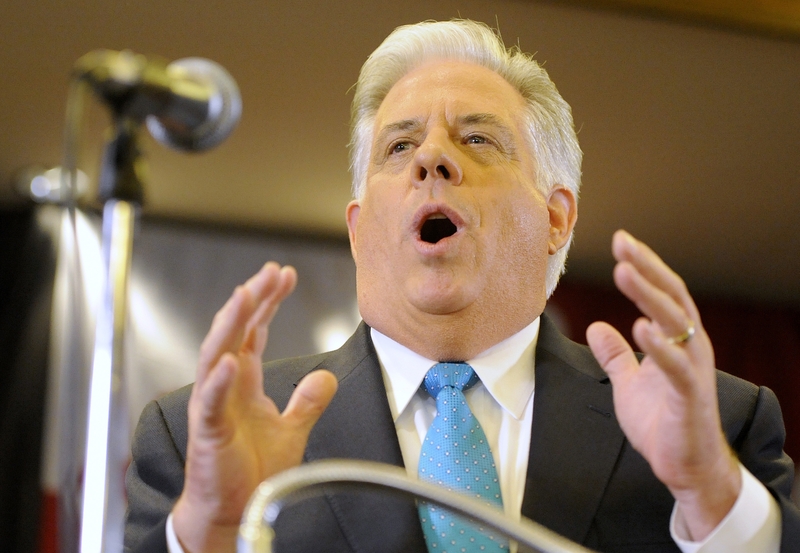 "The party should pay attention to the blue states that won with these governors races," Hogan explained. He said he was proud to win his race with Democratic and Independent votes, and he recalled voters who approached him to say, "I've never voted for a Republican before." Hogan credited his win, along with GOP victories in Illinois and Massachusetts, to an inclusive message focused on "fiscal responsibility and common sense." "It wasn't a partisan message," he explained. "It wasn't focused on social issues, it was focused on lower taxes, creating jobs, and getting the business community and the private sector back on track so we can grow the economy." As the tug of war between the moderate and conservative factions of the GOP takes center stage ahead of the 2016 presidential primary, Hogan cast his lot with those who would expand the party's appeal rather than appealing to narrow, partisan interests. "I think we have to stand for something," he said, "but we obviously have to broaden the tent. And in Maryland, that's what we did." "I'm for growing the party, not shrinking the party," he added. Hogan said he believes the next president will be a former governor, and he advised Republicans to nominate someone who can reach out to Democrats and independents as he did in his successful race. "I think we have to nominate someone that can appeal across party lines, and I think that the governors seem to get that better than folks in Washington do, because they've got to govern for everybody," he explained. "You see a lot more cooperation in states than I think you do in Washington." Hogan did not name any specific potential candidates, but he did thank Gov. Chris Christie, R-New Jersey, and the Republican Governor's Association, which Christie heads, for their timely intervention in his race, saying he couldn't have won without their help. Christie is generally considered one of the more moderate potential candidates in the GOP's 2016 bullpen. Hogan also reflected the lessons he'd taken from his father, who was the first Republican congressman to call for the impeachment of then-President Richard Nixon over the Watergate scandal, and the only congressional Republican to vote for all three articles of impeachment. "It taught me a valuable lesson," he said. "I learned more about integrity and making the tough decisions in one day than most people learn in a lifetime. I'm very proud of my dad." "Sometimes party loyalty demands too much," he added. "You have to actually do what's right for the country and not just what's the politically expedient thing to do."